744 pages | 23 B/W Illus. Drawing on the expertise of multi-degreed doctors, and multi-certified financial advisors, Comprehensive Financial Planning Strategies for Doctors and Advisors: Best Practices from Leading Consultants and Certified Medical Planners™ will shape the industry landscape for the next generation as the current ecosystem strives to keep pace. Traditional generic products and sales-driven advice will yield to a new breed of deeply informed financial advisor or Certified Medical Planner™. The profession is set to be transformed by "cognitive-disruptors" that will significantly impact the $2.8 trillion healthcare marketplace for those financial consultants serving this challenging sector. There will be winners and losers. The text, which contains 24 chapters and champions healthcare providers while informing financial advisors, is divided into four sections compete with glossary of terms, CMP™ curriculum content, and related information sources. Using an engaging style, the book is filled with authoritative guidance and healthcare-centered discussions, providing the tools and techniques to create a personalized financial plan using professional advice. Comprehensive coverage includes topics likes behavioral finance, modern portfolio theory, the capital asset pricing model, and arbitrage pricing theory; as well as insider insights on commercial real estate; high frequency trading platforms and robo-advisors; the Patriot and Sarbanes–Oxley Acts; hospital endowment fund management, ethical wills, giving, and legacy planning; and divorce and other special situations. The result is a codified "must-have" book, for all health industry participants, and those seeking advice from the growing cadre of financial consultants and Certified Medical Planners™ who seek to "do well by doing good," dispensing granular physician-centric financial advice: Omnia pro medicus-clientis. Written by doctors and healthcare professionals, this textbook should be mandatory reading for all medical school students—highly recommended for both young and veteran physicians—and an eliminating factor for any financial advisor who has not read it. The book uses jargon like 'innovative,' 'transformational,' and 'disruptive'—all rightly so! It is the type of definitive financial lifestyle planning book we often seek, but seldom find. This is an excellent book on financial planning for physicians and health professionals. It is all inclusive yet very easy to read with much valuable information. And, I have been expanding my business knowledge with all of Dr. Marcinko's prior books. I highly recommend this one, too. It is a fine educational tool for all doctors. I plan to give a copy of this book written 'by doctors and for doctors' to all my prospects, physician, and nurse clients. It may be the definitive text on this important topic. Personal financial success in the PP-ACA era will be more difficult to achieve than ever before. It requires the next generation of doctors to rethink frugality, delay gratification, and redefine the very definition of success and work–life balance. And, they will surely need the subject matter medical specificity and new-wave professional guidance offered in this book. 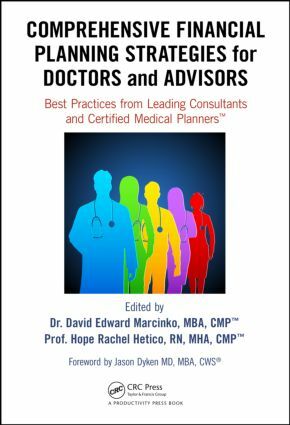 This book is a 'must-read' for all health care professionals, and their financial advisors, who wish to take an active role in creating a new subset of informed and pioneering professionals known as Certified Medical Planners™. This text should be on the bookshelf of all contemporary physicians. The book is physician-focused with unique topics applicable to all medical professionals. But, it also offers helpful insights into the new tax and estate laws, fiduciary accountability for advisors and insurance agents, with investing, asset protection and risk management, and retirement planning strategies with updates for the brave new world of global payments of the Patient Protection and Affordable Care Act. Starting out by encouraging readers to examine their personal 'money blueprint' beliefs and habits, the book is divided into four sections offering holistic life cycle financial information and economic education directed to new, mid-career, and mature physicians. An excellent resource … this textbook is written in a manner that provides physician practice owners with a comprehensive guide to financial planning and related topics for their professional practice in a way that is easily comprehended. The style in which it breaks down the intricacies of the current physician practice landscape makes it a 'must-read' for those physicians (and their advisors) practicing in the volatile era of healthcare reform. Rarely can one find a full compendium of information within a single source or text, but this book communicates the new financial realities we are forced to confront; it is full of opportunities for minimizing tax liability and maximizing income potential. We're recommending it to all our medical practice management clients across the entire healthcare spectrum. Dr. David Edward Marcinko is a next generation apostle of Nobel Laureate Kenneth Joseph Arrow PhD as a healthcare economist, administrative and technology futurist, risk manager and former board certified surgeon from Temple University in Philadelphia. In the past, he edited eight practice-management books, three medical textbooks and manuals in four languages, five financial planning year-books, dozens of interactive CD-ROMs, and three comprehensive healthcare administration dictionaries. Internationally recognized for his clinical work, he is an honorary distinguished visiting professor of surgery at the Marien Hospital - Aachen Germany - who provides litigation support and expert witness testimony in State and Federal Court, with medical publications archived in the Library of Congress and the Library of Medicine at the National Institute of Health [NIH]. His thought leadership essays have been cited in journals like: Managed Care Executives, Healthcare Informatics, Medical Interface, Plastic Surgery Products, Teaching and Learning in Medicine, Orthodontics Today, Chiropractic Products, Journal of the American Medical Association, Podiatry Today, Investment Advisor Magazine, Registered Representative, Financial Advisor Magazine, CFP™ Biz (Journal of Financial Planning), Journal of the American Medical Association (JAMA.ama-assn.org), The Business Journal for Physicians, and Physician's Money Digest; by companies and professional organizations like the Medical Group Management Association (MGMA), American College of Medical Practice Executives (ACMPE), American College of Physician Executives (ACPE), American College of Emergency Room Physicians (ACEP), Health Care Management Associates (HMA), and PhysiciansPractice.com; and by academic institutions like the UCLA School of Medicine, Northern University College of Business, Creighton University, Medical College of Wisconsin, University of North Texas Health Science Center, Washington University School of Medicine, Emory University School of Medicine, and the Goizueta School of Business at Emory University, University of Pennsylvania Medical and Dental Libraries, Southern Illinois College of Medicine, University at Buffalo Health Sciences Library, University of Michigan Dental Library, and the University of Medicine and Dentistry of New Jersey, among many others. Dr. Marcinko also has numerous primary and secondary editorial and reviewing roles to his credit. Dr. Marcinko received his undergraduate degree from Loyola University Maryland, completed his internship and residency at the Atlanta Hospital and Medical Center, is a Fellow of the American College of Foot and Ankle Surgeons, earned his business degree from the Keller Graduate School of Management (Chicago), and his financial planning diploma from Oglethorpe University (Atlanta). He was a licensee of the CERTIFIED FINANCIAL PLANNER® Board of Standards for a decade, and holds the Certified Medical Planner™ designation (CMP™). He earned Series #7 (general securities), Series #63 (uniform securities state law), and Series #65 (investment advisory) licenses from the National Association of Securities Dealers (NASD) and Financial Industry Regulatory Authority (FINRA), and was a life, health, disability, variable annuity, and property-casualty license from the State of Georgia. Dr. Marcinko was also co-founder of an ambulatory surgery center that was sold to a public company, and has been a Certified Physician in Healthcare Quality (CPHQ); a certified American Board of Quality Assurance and Utilization Review Physician (ABQAURP); a medical-staff vice president of a general acute care hospital; an assistant residency director; a founder of a computer-based testing firm for doctors; and president of a regional physician practice-management corporation in the Midwest. He was a member of the American Health Information Management Association (AHIMA) and the Healthcare Information and Management Systems Society (HIMSS); a member of the Microsoft Professional Accountant’s Network (MPAN); website engineer and beta tester for Microsoft Office Live Essentials program, and Microsoft Health User’s Group (MS-HUG) member; and a registered member of the US Microsoft Partners Program (MPP). And, as president of a privately held physician practice management corporation in 1999, he consolidated 95 solo medical practices with $150 million in revenues for a pre-IPO listing. In 2011, he joined the Physician Nexus Medical Advisory Board. Currently, Dr. Marcinko is Chief Executive Officer for the Institute of Medical Business Advisors, Inc. The firm is headquartered in Atlanta and works with a diverse list of individual and corporate clients. It sponsors the professional Certified Medical Planner™ charter designation program and counsels maverick physicians transitioning into alternate careers.As a nationally recognized educational resource center and referral alliance, iMBA and its network of independent professionals provide solutions and managerial peace-of-mind to physicians, healthcare organizations and their consulting business advisors. He also helped developed medical, business, graduate and undergraduate school curriculum content for the American College of Physician Executives [ACPE], Medical Group Management Association [MGMA] and the American College of Healthcare Executives [ACHE]. A favorite on the lecture circuit, Dr. Marcinko is often quoted in the media, and frequently speaks on related topics throughout this country and Europe in an entertaining and witty fashion. He is a popular authority on transformational business strategies across a pantheon of related industries. He is also a social media pioneer and publisher of the Medical Executive Post, an influential syndicated Health 2.0 interactive blog forum. As an award-winning journalist, media broadcaster, speaker, public health ambassador, financial planning and economics consultant, Dr. Marcinko is available to colleagues, clients and the press at his corporate office in Atlanta. Georgia. Hope Rachel Hetico received her bachelor’s degree in nursing (BSN) from Valparaiso University, and her Master of Science in Healthcare Administration (MHA) from the University of St. Francis, in Joliette, Illinois. She is author’s editor of a dozen major textbooks and is a nationally known expert in managed medical care, medical reimbursement, case management, health insurance, utilization review, National Association of Healthcare Quality (NAHQ), Health Education Data Information Set (HEDIS), and The Joint Commission (TJC) Clinical Quality Measures [CQMs] and regulations. Prior to joining the Institute of Medical Business Advisors as Chief Operating Officer, Ms. Hetico was a hospital executive, financial advisor, insurance agent, Certified Professional in Healthcare Quality (CPHQ), and distinguished visiting assistant professor of healthcare administration for the University of Phoenix, Graduate School of Business and Management in Atlanta. She was also national corporate Director for Medical Quality Improvement at Abbey, and then Apria Healthcare, a public company in Costa Mesa, California. A devotee of health information technology and heutagogy, Ms. Hetico is responsible for leading the website: www.CertifiedMedicalPlanner.org to the top of the exploding adult educational marketplace, expanding the online and on-ground CMP™ charter designation program, and nurturing the company’s rapidly growing list of medical colleagues and financial services industry clients. Professor Hetico recently completed successful consulting engagements as ACO clinical integration coordinator for Resurrection Health Care Preferred in Chicago; and as performance improvement manager for Emory University and Saint Joseph’s Hospital in Atlanta. She is currently on assignment for Presence Health Partners, the largest Catholic health system in Illinois. Mackenzie H. Marcinko is a computer science, linguistics and business management intern from the University of Pittsburgh. Founded in 1787, the university is a healthcare informatics and technology pioneer, and one of the nation’s most distinguished members of the Association of American Universities. It perennially ranks as one of the top public universities in total sponsored research funding and is among the top ten recipients of funding from the National Institutes of Health [NIH]. For the Institute of Medical Business Advisors Inc., and the Certified Medical Planner™ online professional education and certification designation program, Norcross, Georgia. Former Intensive Care Unit [ICU] and Telemetry Unit [TU] manager, nursing school instructor, and Finnish Rest Home BOD member, Lantana, Florida. Hospital administrator and financial consultant for the Tseung Kwan O Hospital, Hong Kong, who speaks English, Cantonese, Mandarin and Chinese.